Working for Modern is more than a job, it’s a way of life. We are always looking for energetic, friendly, dynamic people who want to be part of our work family. Modern’s steady growth continues to provide significant career opportunities for our employees, while opening the door for those motivated individuals who would like to bring their talent to our team. 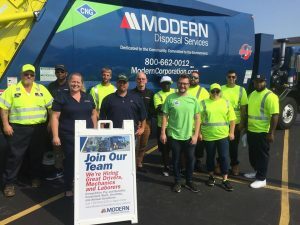 People with a drive for success have made Modern the region’s most respected waste management company. Our team exemplifies “the Modern Way” best defined as a passion for innovation, a strong sense of corporate values, dedication to the community, and a commitment to exceeding our customer’s expectations. We work hard to keep the outstanding reputation earned by Modern employees. This means hiring the best and doing whatever we can to help you excel. We are committed to being the employer of choice in the industry by offering the Modern Academy to welcome new employees, strong continuous training programs, along with competitive pay and a comprehensive benefits package. When asked what working at Modern is like, many employees use words like “special” and say it’s like a family. Life at Modern is not only about creating a safe, customer focused environment, it’s also about having fun! With company picnics, hot dog roasts, and recognition events, we work hard to create an atmosphere of trust, collaboration, and dedication. We make certain every employee knows how much they are valued. We also pride ourselves on being good neighbors. Being a good neighbor means giving back to the communities – and people – we serve. We are proud of our tradition of community involvement. Whether it’s the arts, community events, providing education and outreach programs or filling a specific need, the Modern Way enriches the area we call home. For job listings at our Canadian locations, please click here.